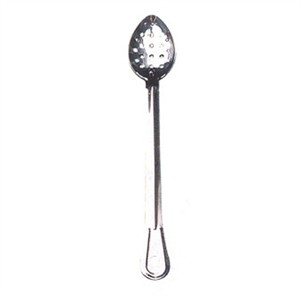 Featuring stainless steel construction with a perforated head, the Winco BSPT-11 Perforated Basting Spoon with Stainless Steel Handle, 11" is a must-have for restaurants, hotels, caterers and cafeterias. This long-handled basting spoon keeps hands a safe distance from cooking heat, and the perforated head allows unwanted juices and liquids to drain through. A hang hole on the handle lets you store the spoon out of the way but within easy reach.